Prepare a hamper, find a blanket and grab your camera – you're off to the floating lookout known as Clark Island. Situated off Darling Point, it affords fine views of the Opera House, Harbour Bridge and CBD. The tiny landmass was named after Lieutenant Ralph Clark, a member of the First Fleet, who made a failed attempt to establish a vegetable garden there. 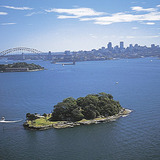 Today, it is uninhabited, and forms part of the Sydney Harbour National Park. Although there's nothing to actually 'do' on Clarky, why would you let that bother you? If you've got good food, good company and a good book, the hours will pass in a rush. Pick a spot under one of the plentiful trees, spread out your blanket in the shade, and relax. The only way to access the island is by private vessel or these licensed operators. While it contains toilets and drinking water, there are no bins, so you'll have to take your rubbish with you. Alcohol is permitted, but pets aren't.